Hi folks happy Halloween but for today I don't have a Halloween card but a christmascard. Since Christmas is around the corner I have to make some christmascards for my stash otherwise it will be last minute work. I loved the last release and that image is so, so cute. Diecut a panel from white cardstock and diecut a circle out of some left over paper. I used the negative diecut to sponge te circle with distress ink. First I stamped the cling stamp and white heat embossed it. I stamped the friendly turn on some vellum and white heat embossed it and fuzzy cut it. Then I adhered it on the panel with a brad in the middle. Stamped the sentiment and so finished the card. Try stamping images on vellum and heat emboss them. To give them some extra interest place them against a colored background and they will pop. Play along with our monthly challenge and upload your projects we love to see them. Hi everyone! How's your week been? 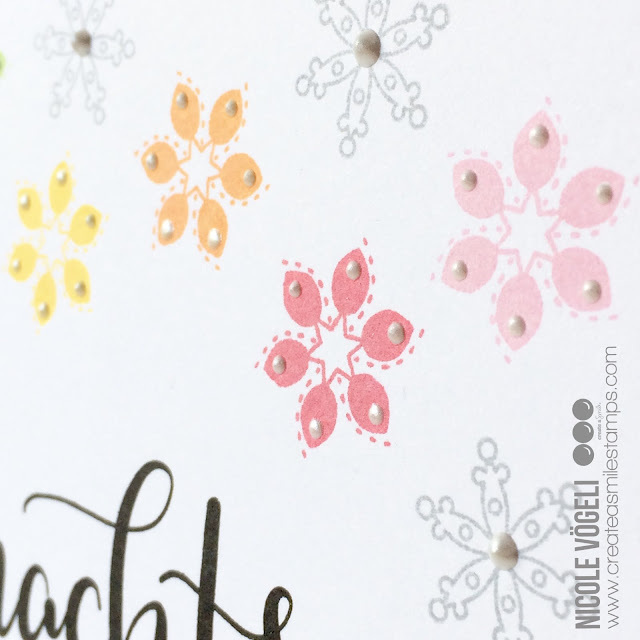 I've decided to share some ways to add some simple stitching to you card :) I've made a card with some stitching before and you can see it here. So in the next couple of weeks, I will share various ways you can add stitching to your cards. Today's method is a way to colour your image but using stitching. For this card, I used kraft paper, distress ink (Walnut Stain) - using any brown ink you have, stamp of your choice, some strings. I've had these floss years ago as a gift so I'm trying to incorporate them into my cards. Stamp all the candles and start poking holes in the image, using the lines as a guide so that I can "colour" the image. Simple stitching. Nothing complicated, just lines. You can do this in various colours and styles. To add some "flaming" colours, I sponged in Distress Ink Barn Door. Added gold glitter as flames and my sentiment and there you go! A way to "colour" your images using strings. I hope you'll try this method. Come back next week for another idea! The new release is fabulous, isn't it? So many awesome sets, I can't decide which one is my favorite! But I do for sure LOVE Christine's handlettering! It's amazing! 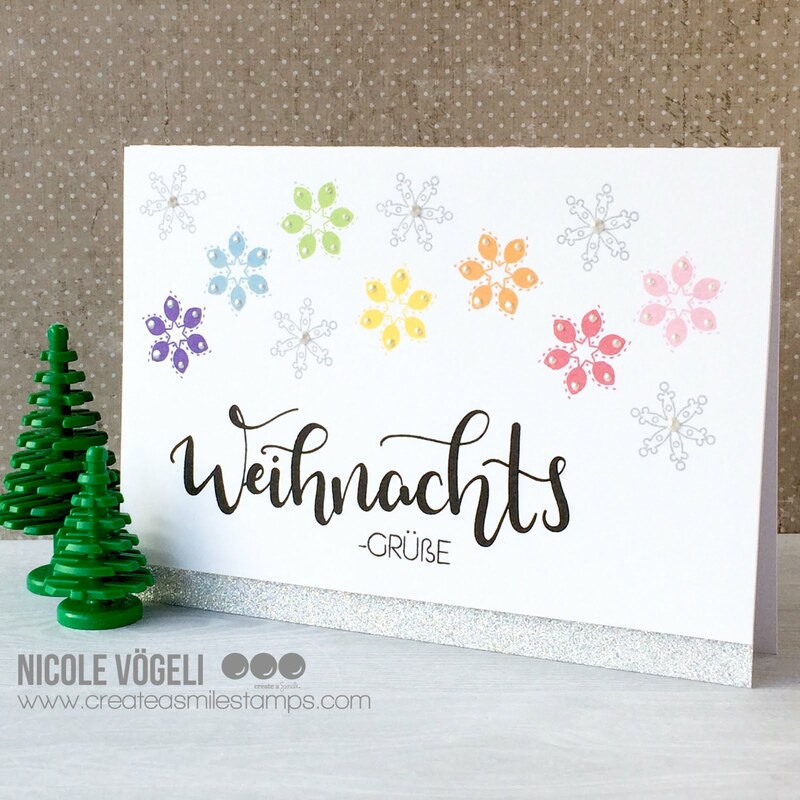 I started with the very pretty handletterd "Weinachts" (Christmas) and knew I wanted to create a ink blended background for this beauty! When the background was finished I decided I wanted some orange to go with it. So I went throughmy stash of Create a Smile stamps I searched for something I could color in Orange! And there he was this cute little fox! I added two friends - a penguin and a snowman! Go with a flow: The card doesn't have to be "finished" in your head when you start crafting. I often get the best ideas during the process. I think we all love watersplatters on Distress Ink backgrounds. For Christmas cards I like to take it one step further: I add perfect pearls to the water to get a little bit of sparkle! I like to go with complementary colors when I go for a bright card. That's why I choose orange for my blue and turquoise background. 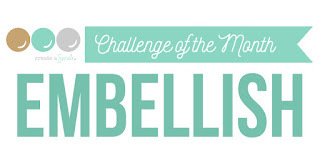 There are still a few days left to enter the challenge for this month! There is a great prize! 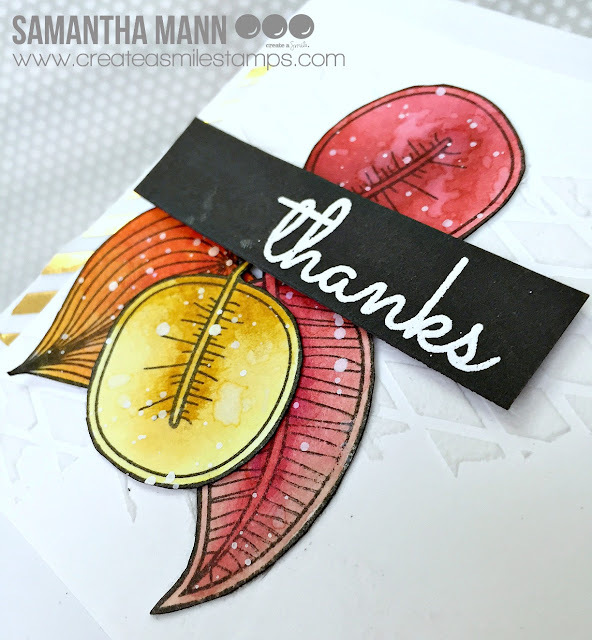 Samantha here and today I'm sharing a fall themed thank you card using one of my favorite stamp sets! Those leaves are SO MUCH FUN to watercolor! I just couldn't resist stamping a bunch out and having fun with autumn colors! So, let's start making this card, shall we? - watercolor with your preferred watercolors! I used Distress Markers for mine, but there are so many other watercolor choices out there, too! - once the leaves are dry, fussy cut out and arrange on your card front! - the sentiment was heat embossed onto some black cardstock and then popped up with foam tape! - I finished off the card with a torn strip of some gold vellum paper! I love the look of gold with the warm autumnal colors! Depending on your color choices, it doesn't have to be a 'fall' themed card at all! If you chose to use bright, happy colors, it would be perfect year round! 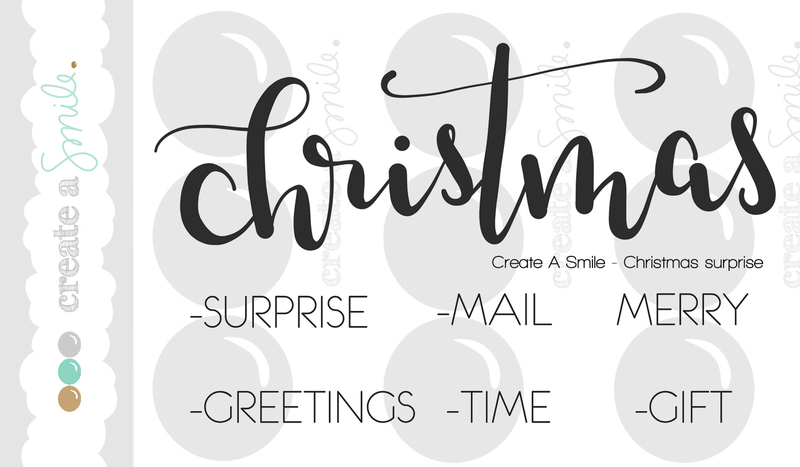 I used the adorable Time to Say Thanks stamp set along with the Diamonds Stencil! Did you check out the new release for October?! It's so adorable and FUN! You can see the whole release here! :) Enjoy! It's as simple as it looks. 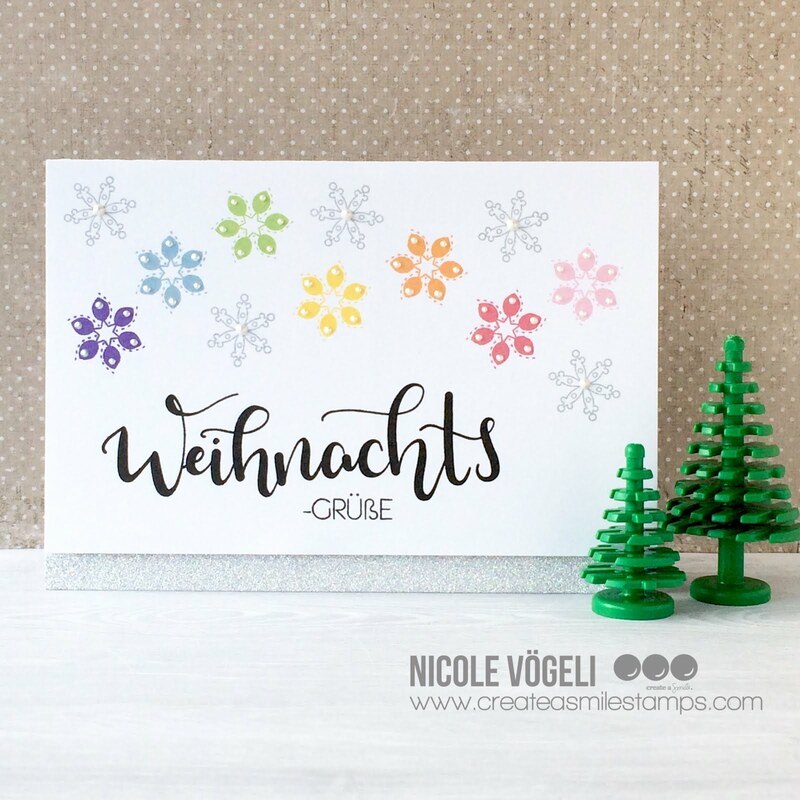 Stamp the greeting with a black ink and stamp some snowflakes in rainbow colors and you're done. To add a little more interest, I added some gray snowflakes and some pearl drops as well. To finish up my card, I cut it down a little, mounted it on some foam tape and put a stripe of silver washi tape on my card base. There's still time to play along the monthly challenge. It's Justine again, I am super excited to be back after taking last month off. I was in the process of moving and FINALLY my crafty things will arrive next week. I was able to smuggle a few things with me in what little suitcase space I had left and these stamps made it over with me. I wanted to create something very subtle and elegant and also very different from what I have created in the past with the Botanical Love stamp set (my favourite stamp set of all time! I even had to invest in a second set!) Also, things are staring to get a bit gray outside so I thought - why not create a pretty card to match the not-so-pretty weather. 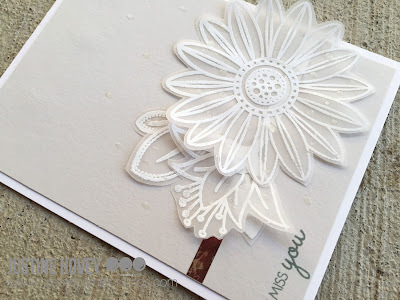 In order to learn how to make this card, why don't you check out my video tutorial below. When using wet liquids on your card that need to dry, consider leaving it to dry before attaching it to the base. It saves a lot of tears, mess and more tears from ruining your card. The October release is HERE... like... NOW! Warm Wishes from Pretty Penguins! Wishing You a Cool Christmas! You're a Treasure/Du bist ein Schatz!